Here is Peter Sharples account of being a contestant on The Buzy Buzzy Bee Game. 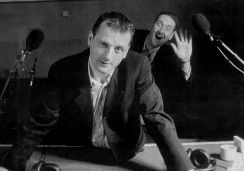 I first came across Mark Radcliffe in the flesh in about 1995/6-ish, when I was with my brother and nephew at Leverhulme Park in Bolton. We were at the kiddies' playground when a familiar bespectacled figure appeared with child in tow. Mark promptly began messing about on the swings and slides with who I later discovered was his niece, and looked suitably sheepish when I told him that this was all blackmailable stuff! I was a bit in awe which was a shame in many ways as I got the impression the great man would have been quite happy to chat a while. In March 1998 I was a contestant on the second ever 'Busy Buzzy Bee Game'. I was put up in the Britannia Hotel in Manchester and needless to say got drunk into the wee hours with Sarah, the other contestant, and her boyfriend (the original 'person in the corner we don't know'). I was well tired when it came to heading to Oxford Road the following morning but it was a very memorable occasion. Lard appeared in the waiting area to deliver a cheery 'Hiya!' and we were in the studio an hour, the competition was great fun and I won through to Lard's 'Busy Buzzy Bee Challenge'. I became the first person to complete the course and won a jar of Tesco Greek Honey for my efforts! The guys were terrific, no showbiz pretensions, just very matey. Part of their appeal is that they come across as the types who'd happily share several pints with you and that impression is borne out when meeting them behind the scenes. Mark even remembered the playground incident! For the last half hour I was sat at the 'top table' with Lard and Patrick and both made me feel like one of the team. I was getting very much involved, looking for stuff in the papers and suggesting ideas. The most interesting thing about appearing with them was watching how hard they work, how quickly they keep their shows moving. Yet they still manage to enjoy themselves! I thought it was a shame they were chucked off the Breakfast Show, but you could see the way the content was pared back a bit during the summer it was coming. Thanks to Peter Sharples for sending this account in.